One of most common questions we receive here at Bridging The Gaps Ministries is from parents who want to speak to the matter of homosexuality with their children. Most parents expressed their concern to speak with their children about homosexuality before they were taught about it in their school classrooms or from something they watched on television. I’ve spent a good deal of time, basically, the last two years, researching this question. Rather than reinvent the wheel and write something that has already been written, I hoped to find a resource to recommend. The search ended today when I was lead to this free resource at Focus on the Family. 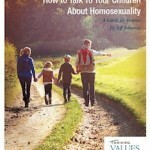 They recently released this resource entitled How to Talk With Your Children About Homosexuality. Click on the link below.It takes you to the page on Focus on the Family website that has the free download. Let me know if the link is not working. This resource does not provide information or advice about helping children or teens who have “come out” and identify as gay or bisexual, nor does it assist those who are struggling with gender confusion, or counseling those who were sexually abused and may be questioning their sexual identity. We are working on providing those resources to you as soon as possible. Instead, this guide is for parents addressing their children about homosexuality when it is encountered in the culture.